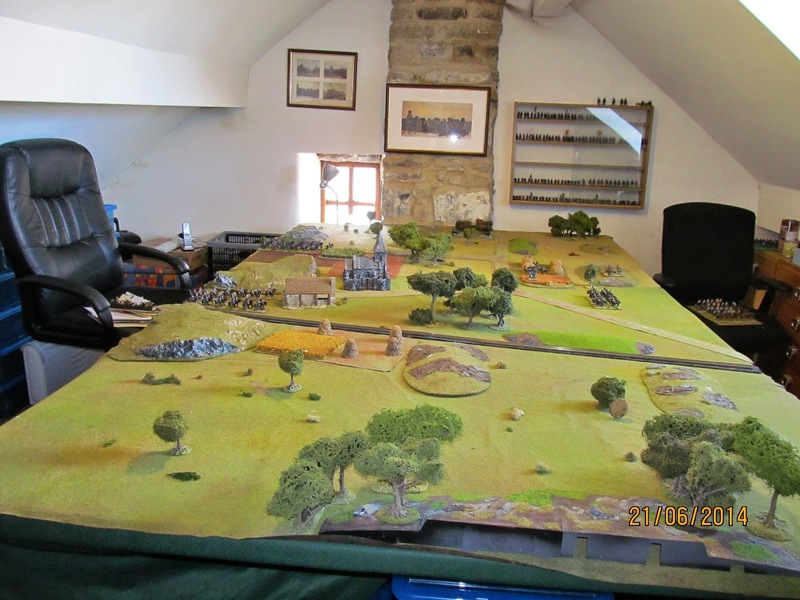 Carryings On Up The Dale: 1866: Battle for the frontier, Part III, the end? I think not. 1866: Battle for the frontier, Part III, the end? I think not. 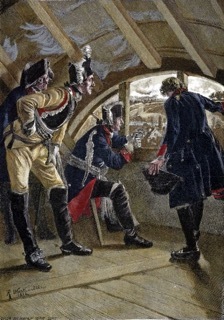 The final chance for the Prussians to oust the Austrians from their positions was there. I'd moved the terrain about a foot and a half to the right, thus giving some more space on the Prussian right should they wish to try a flanking attack. Well, of course they would! That's the whole point. Having pinned the Austro/Saxons with the previous two assaults their flanking force ought now in position to make an appearance and hopefully help roll up the Austrian/Saxon flank. 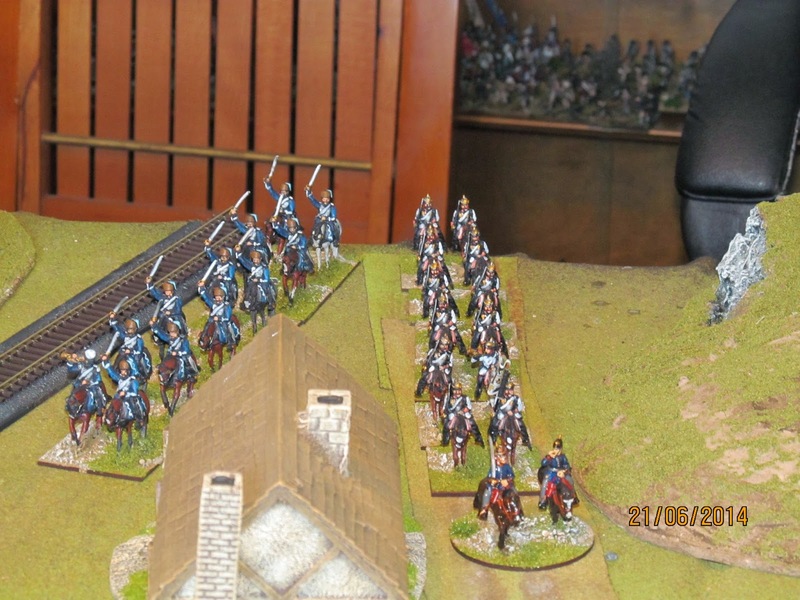 Prussian advance guard cautiously approaches the thinly spread Austrian defenders. Good plan but I then decided that No, this was not the answer. The Austrians would have been (and generally were) covering all the mountain passes so it's unlikely that any flanking move would have been unopposed. 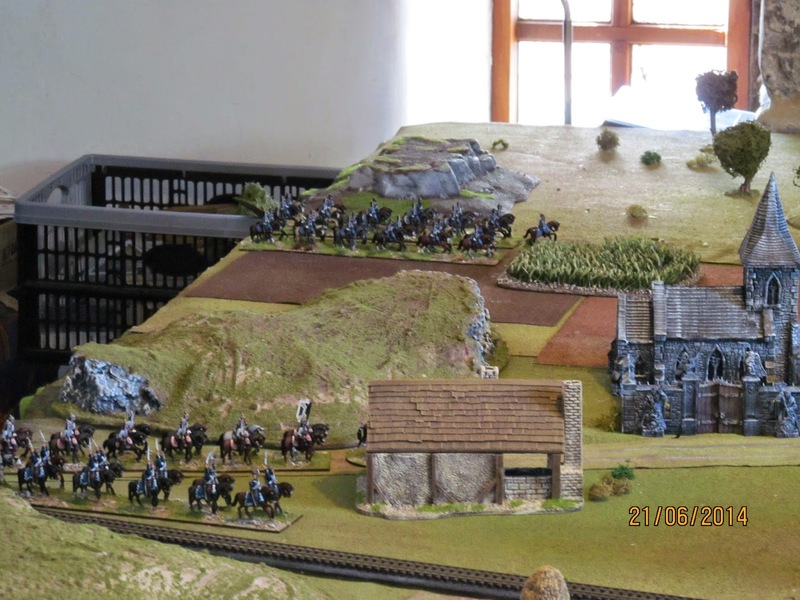 With that in mind I set up another game, with the Prussians again debouching from the mountains with the aim of punching through the Austrian covering force and arriving on the flank of those Austrians holding off the Prussian attacks described in parts I and II of this series of reports. 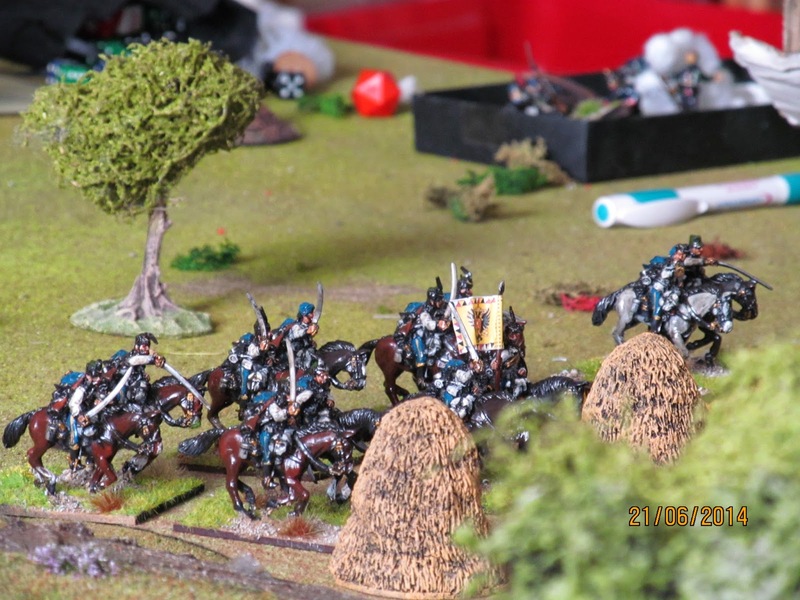 Paul agreed to come up for a game and took the Prussians. I had the Austrians again. 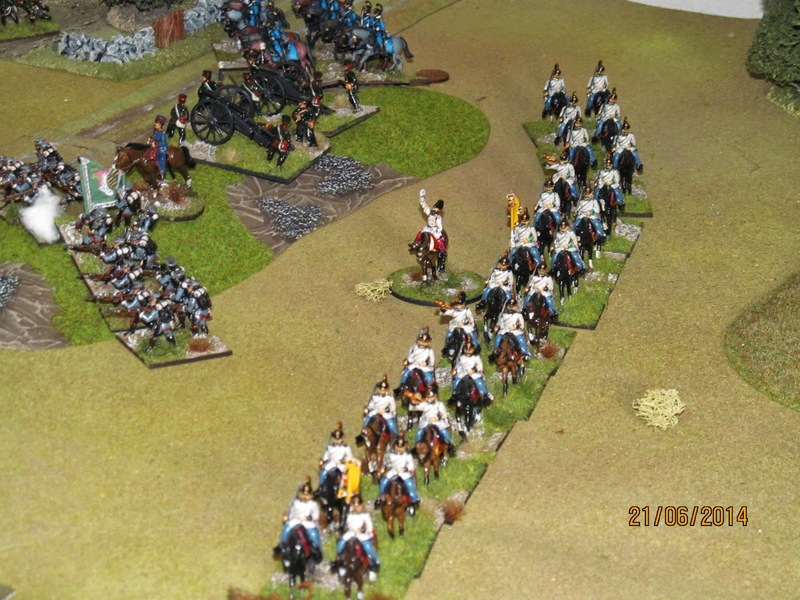 The Prussians began with their cavalry (2 brigades) on the table. The rest (an advance guard of infantry followed by two large brigades of infantry with the reserve artillery trailing in the rear) would arrive in column of march. 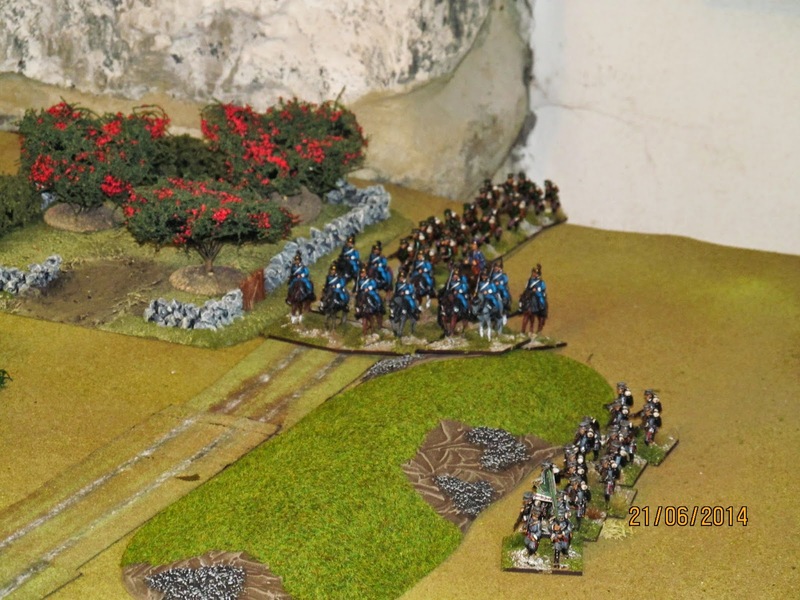 This meant that subsequent reinforcements could not enter until all troops ahead of them were on the table and caused Paul a few problems throughout the game. 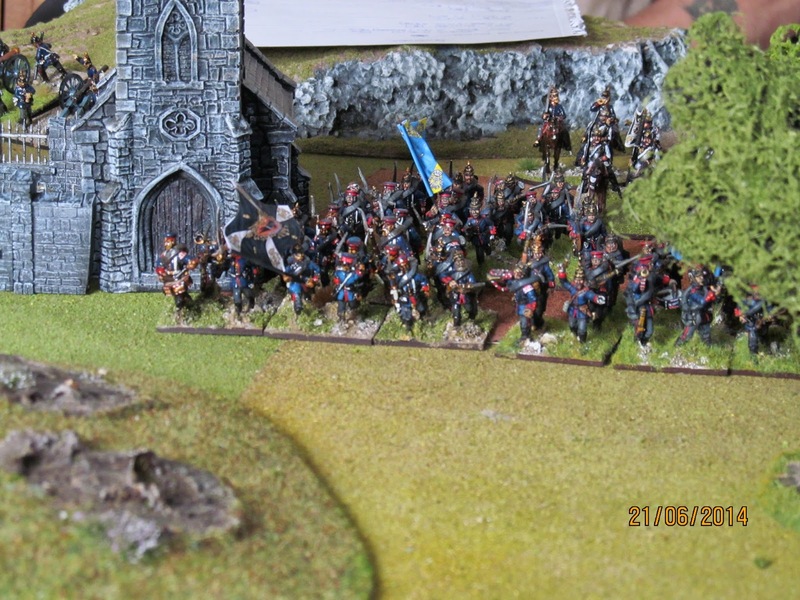 Above: Saxon reinforcements Below: The Prussians are disordered and halted by Austrian artillery fire. 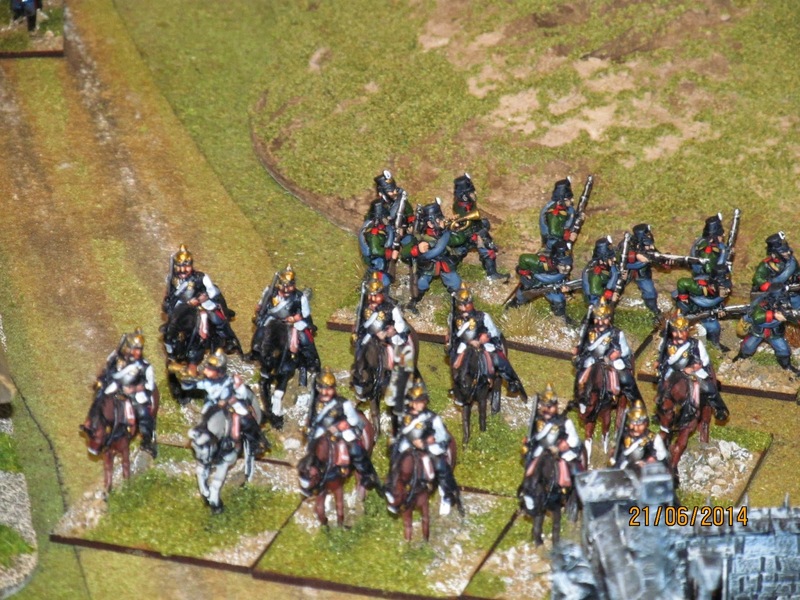 Above: Cuirassiers screen the Prussian Jagers. 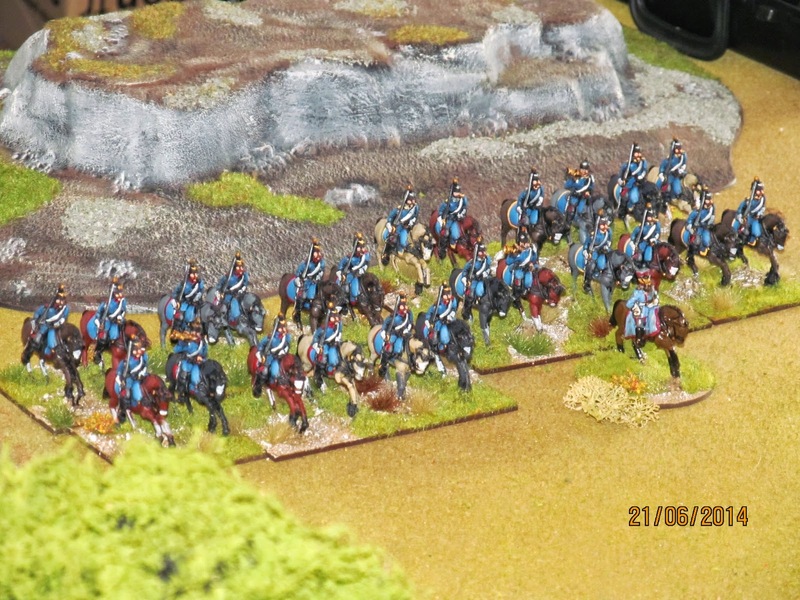 Below: The Prussian Dragoon brigade before it made its unsuccessful charge. 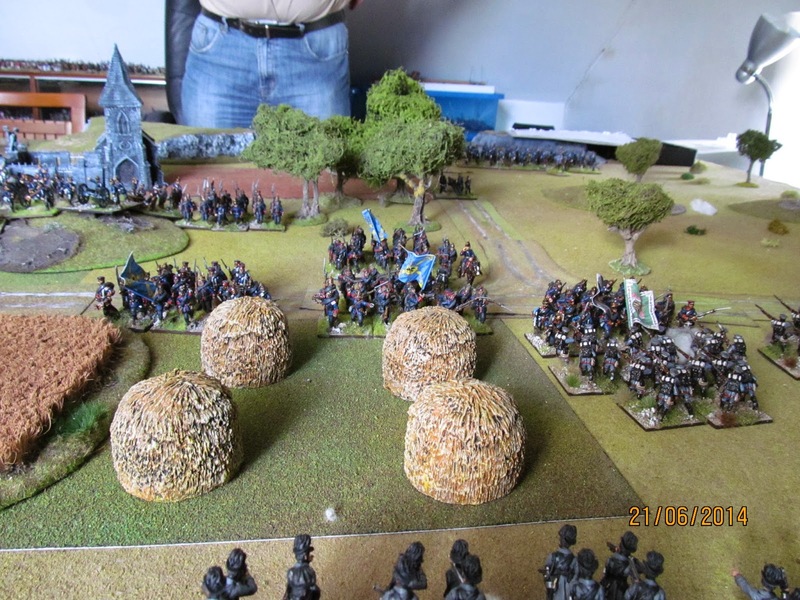 Above: Austrian cavalry move towards the centre covered by their Saxon allies. 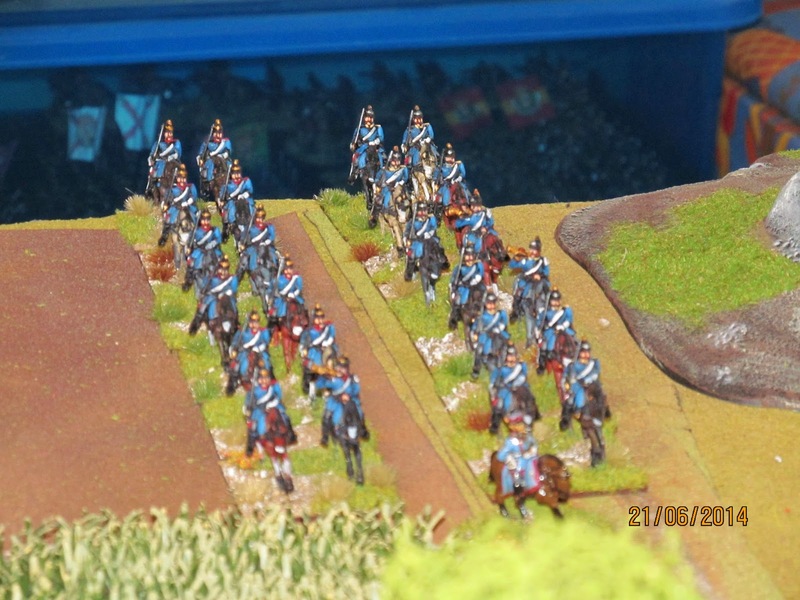 Below: Prussian assault columns about to launch themselves into the attack in the centre. 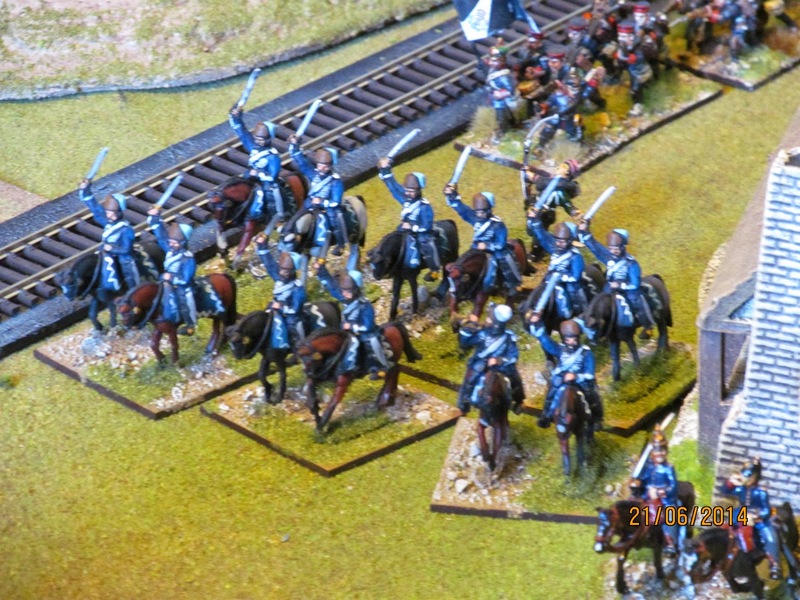 The newly-painted Prussian dragoon brigade clashed with Saxon cavalry and was promptly driven off as is ever the case with brand new units that were only finished the evening before! 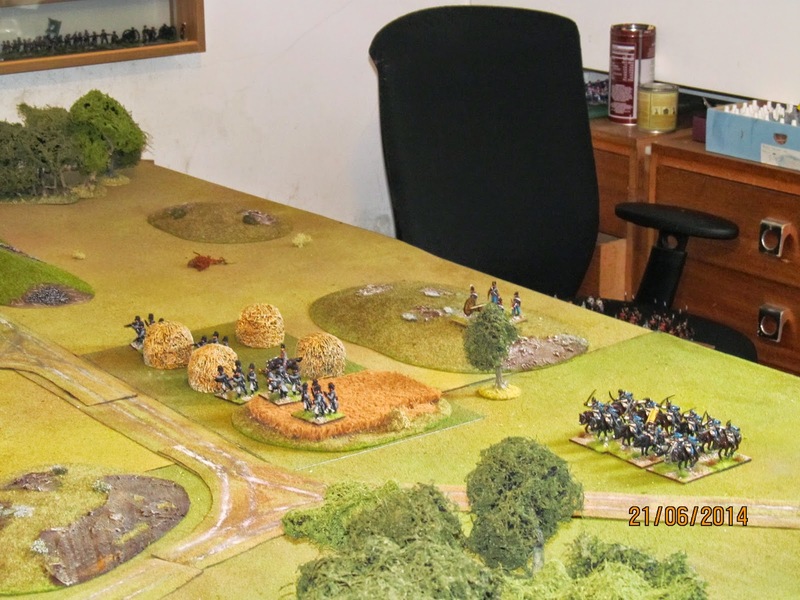 In the centre the Prussians were able to close with the few Austrians positioned there but were held up by some effective artillery fire that caused a certain amount of unwanted and untimely disorder. 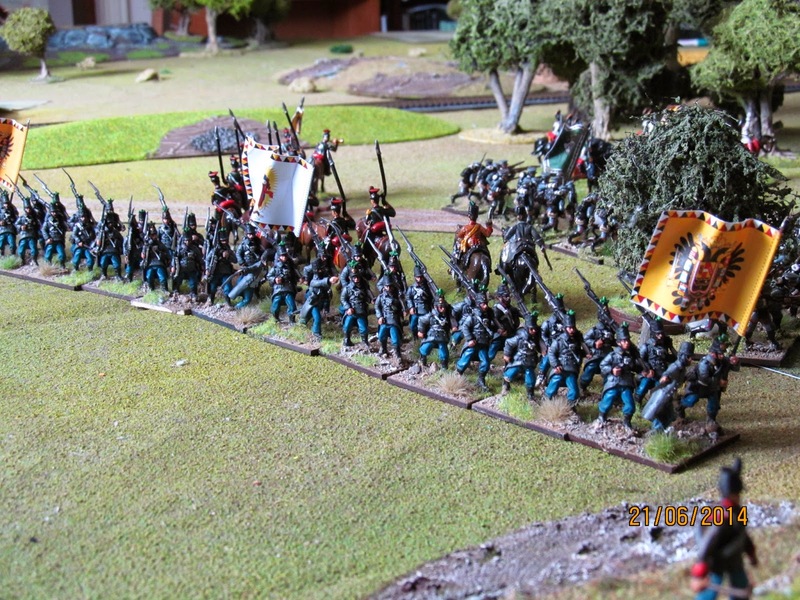 The Prussian hussars made a wide sweep to their right and this was countered by my hussars. 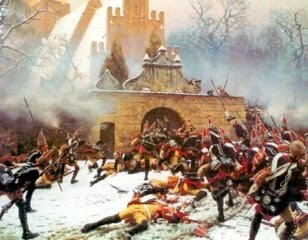 eventually they clashed and the Prussians were broken. Sadly, the Austrians had become shaken so were not in good shape to continue the fight. 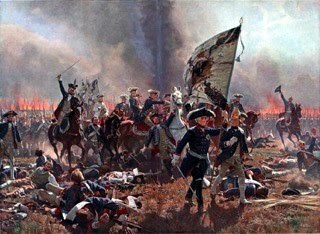 Above: The final Prussian assault. Below: Austrian reinforcements. 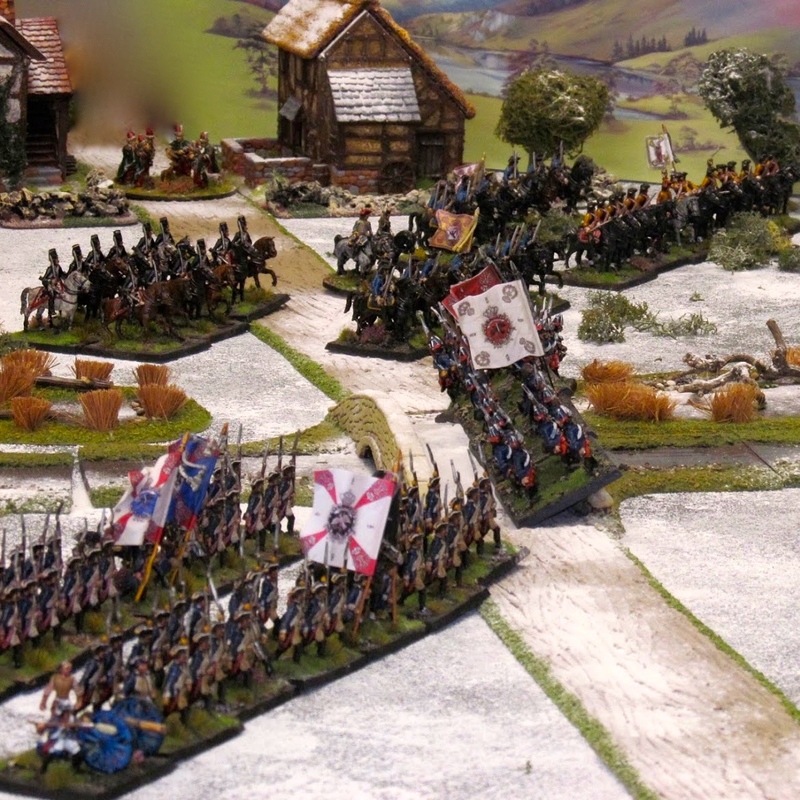 The Prussians were able to close with the Austrians and Saxons holding the centre and take advantage of two gaps in the line to get five battalions off the table before they were closed by Austrian reinforcements. Their arrival put a stop to any more serious Prussian attacks but it was agreed that the Prussians had won a very marginal victory as they had achieved their goal of exiting sufficient troops off the Austrian baseline and still had significant numbers of troops available. 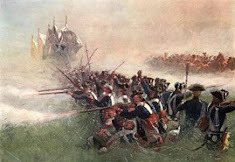 However, the Austrians were unbroken and no more troops were likely to get past them. In the context of the mini campaign that is being played out, there the Austrians successfully holding back the Prussians from parts I and II would be able to retire in good order and avoid being flanked. Similarly, the Prussians would be unable to prevent the withdrawal of the Austrians in part III. Their attempted flanking move left one of their brigades isolated and the two corps involved in both engagements were quite battered while most of the Austrians and Saxons were largely unbroken. The rules worked well again. 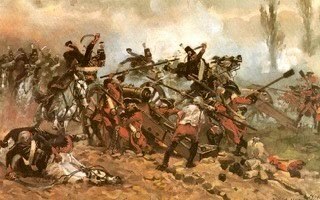 Paul's only quibble was the effect of long range artillery fire in disordering his troops. While I can see the point, and have seen others attempt to overcome this by either not allowing long range fire to cause disorder, doing this upsets the balance of game, especially given the potential move distances involved. Being shot at and hit by high explosive or air burst shells at any range must be disconcerting, even if nobody is killed, which is what the effect of disorder is attempting to reflect. Enjoyed that! Nice report and fine pictures of the game too.